Grid-scale energy storage is one of the key enablers of a low carbon energy infrastructure, delivering multiple benefits, including enhanced security of supply and reduced generation operating costs. A recent report from the Carbon Trust and Imperial College London, Can storage help reduce the cost of a future UK electricity system?, shows that the high level of flexibility that storage can provide significantly reduces the integration cost of renewable generation and also the need for costly curtailment. Thus energy storage technologies can greatly influence the generation mix in favour of renewables. The report strongly demonstrates that energy storage is critical for designing a cost-effective, decarbonised electricity system. Academics at leading universities from across the UK, working across major EPSRC programmes, are brought together by the Energy Storage for Low Carbon Grids project: an EPSRC-funded Grand Challenge Project. 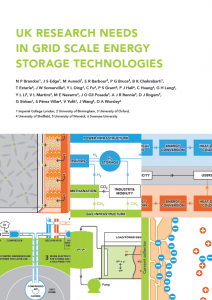 This project is run by a consortium comprising twelve academics from six UK academic institutions, all internationally leading researchers of a range of energy storage technologies, joining forces to address the immediate and long-term challenges in grid-scale energy storage through a multidisciplinary, whole-systems approach. The best solutions can be found by considering a range of aspects, from the economics of electricity systems to advanced control and management of diverse technologies connected to the grid; from improvements in manufacturing methods through to physics and chemistry of the materials used to build the components and devices of an energy storage system. The consortium have just launched their first White Paper, entitled “UK Research Needs in Grid Scale Energy Storage Technologies”. 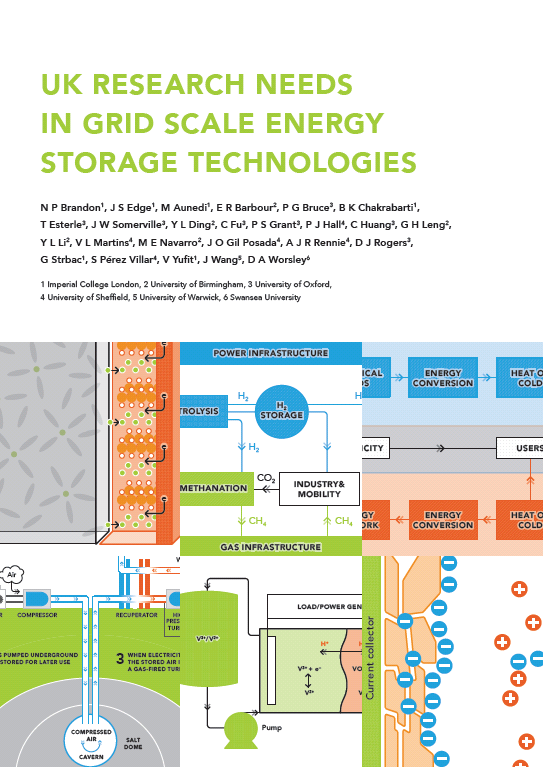 The White Paper outlines the most pressing challenges for grid-scale energy storage to be realised in the UK, showing the way forward for researchers working in this field as well as informing governing and funding bodies where resources could be allocated for optimal impact. The white paper addresses the role and value of energy storage, lithium and sodium batteries, aqueous batteries, supercapacitors, redox flow batteries, compressed air energy storage, thermal energy storage, power to gas and the control and integration of energy storage into the grid.